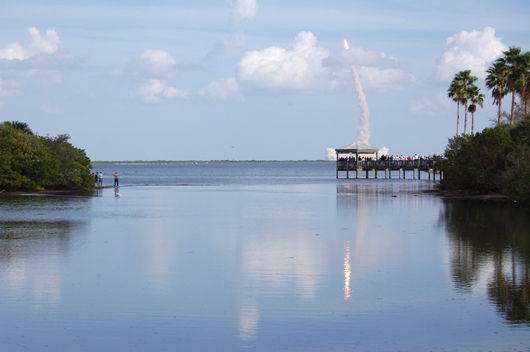 I went about 30 miles north of Melbourne to Space View Park in Titusville to watch shuttle Atlantis blast off today. It is mission STS-122, to deliver the European space lab Columbus to the International Space Station. It has been two months since the original launch date. 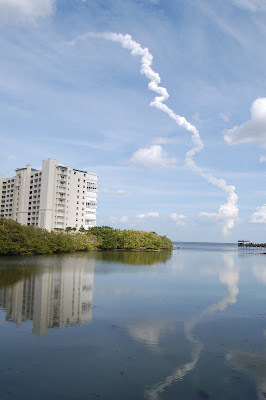 Faulty fuel sensors caused two other launch attempts to be scrubbed. And it was looking as though today wasn't going to work either. 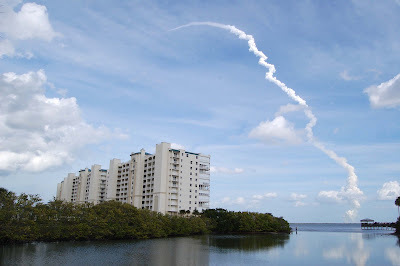 NASA was predicting a 30 percent chance of launch because of a cold front moving through Florida. Rain and wind would mean a certain end of the countdown. But the weather held off. I heard one man at the park say to his girlfriend, "It's Florida. If you don't like the weather, just wait a minute." Hmm. Funny. That's what we used to say about Maine. Actually, I don't think Florida weather is all that unpredictable. Here's the three-day forecast, according to The Offlede: Friday, sunny with a chance of rain; Saturday, sunny with a chance of rain; Sunday, sunny with a chance of rain. 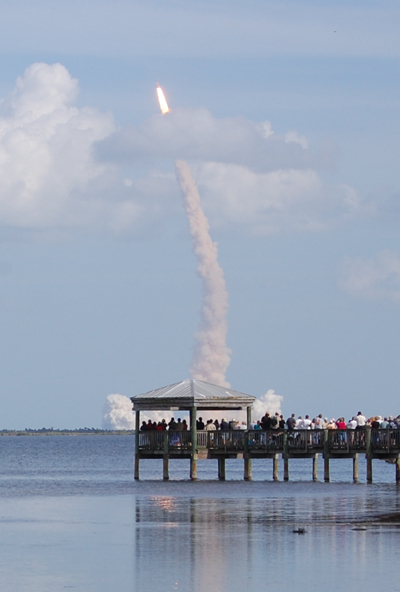 The park was full of people, especially on the pier where dozens gathered to watch the launch and listen to NASA controllers on radios. When I arrived, I noticed an inlet lined with palm trees. It seemed to be a direct visual corridor to launch pad 39A. In addition, Steve Ueckert, a photographer for the Houston Chronicle, was there with a much more expensive and better camera, which made me quite jealous. I set my tripod right next to his. His two-foot lens didn't compare to my 55mm Nikon. You can view his shots here. If you're wondering why many of his photos are in different locations, I overheard him saying how it's done. 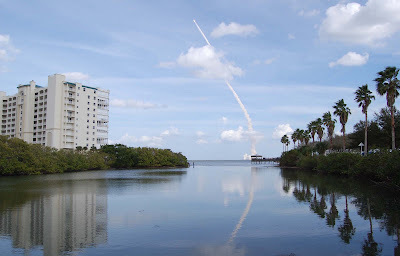 He had several cameras around the pad that were set up to take photos remotely. It's too bad the space program doesn't get more media coverage than it does. And it only gets it when something bad happens, such as the Columbia disaster a few years ago. 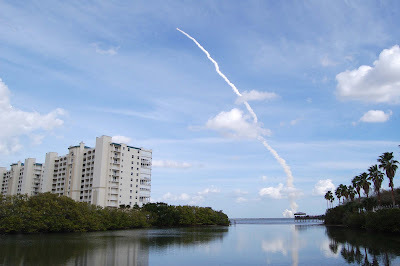 Leading up to this launch, the FLORIDA TODAY editorial board urged NASA not to cut any corners when it comes to safety. There were fears that NASA wasn't taking the fuel sensor issue seriously. And the newspaper does have a disaster plan in place if something bad ever does happen. My 55mm Nikon didn't compare to his two-foot lens.